First the diplomats’ harvest, now the diplomats’ wine! The Ministry of Agriculture held its now traditional diplomats’ harvest at the Hajós-Baja Koch Winery in 2016. The ambassadors picked so much Chardonnay that Minister Sándor Fazekas proposed making a special wine from it. The 2016 diplomats’ wine, or rather Csaba Koch’s Chardonnay with the fancy name Together in Wine, made its debut at the National Wines of Excellence Program’s traditional Advent wine preview in front of the ambassadors accredited to Hungary. The President of the National Wine Expert Commission (OBB), András Horkay International Wine Academic, presented the wines, including the diplomatic wine made from the grapes harvested by ambassadors in September, to the Delegation heads in the Várkert Bazár restaurant. The latest diplomats’ harvest was not just a representative event; the ambassadors picked grapes from the Hajós-Baja estate’s best Chardonnay vines for nearly two hours, resulting in more than a thousand kilos of fruit in their baskets and then the press. Csaba Koch produced the wine with special care from selected grapes and bottled it at the start of December following brief maturation in oak. 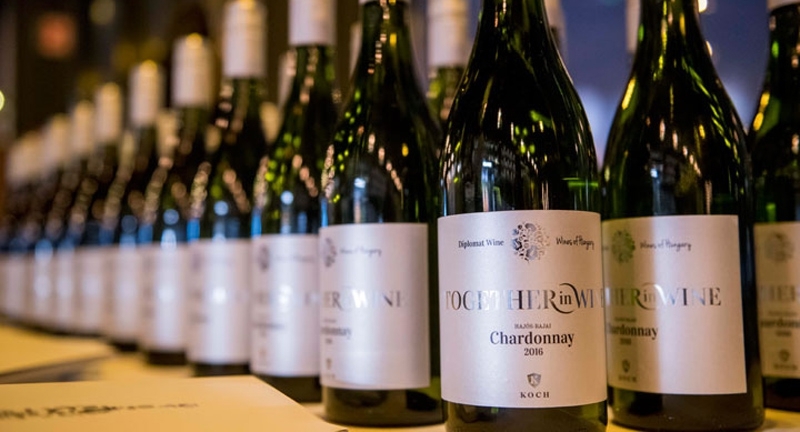 This slightly buttery, fragrant Chardonnay will not go on sale commercially, but will primarily play a representative role at the Koch Winery’s special tasting events. “I really like Csaba Koch’s wines and I hope that the grapes we picked will produce a wine as good as the rest of his wines”, former French ambassador Roland Galharague said during the September harvest. The praise of the wine superpower’s representative counts for a lot, especially relating to a wine region like Hajós-Baja, little known outside Hungary. Many diplomats, including former US ambassador Colleen Bell, didn’t only valiantly pull their weight in the vineyard, but also purchased Csaba Koch’s award-winning (both nationally and internationally) Kadarka, his 2013 late-harvest Chardonnay and the president of the wine region’s Villány Koch Vin Art Winery’s flagship wine, Csanád. Minister Sándor Fazekas, who also participated in the harvest, pointed out that “Hungarian wine-making is experiencing a period of quality renaissance” and that the wonderful wines from the 2016 vintage could strengthen Hungary’s image in the world. “The increasingly high-quality Hungarian wines have already become an effective diplomatic tool; strengthening friendly relationships between countries while also being the precursors of common economic successes,” he emphasized.